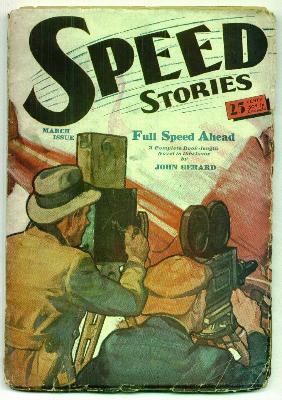 I’ve posted a new blog on Speed, Writing, and Popular Magazines over on the Pulp Magazines Project blog, and thought that it would be of enough interest to MagMod subscribers to repost here. Enjoy. I’m not sure how much of a case I have to make for Speed being an integral component to modernist dynamics; it is pretty standard stuff if we consider “speed” metonymic for technology, for the instability of time, for the artistic attempt to capture movement and simultaneity. The idea of speed fascinated and frustrated modernists. It was a predominant theme, whether as influenced by technology or by Einstein via Bertrand Russell, or Vico via Yeats and Joyce, or Bergson via Proust. Yet I would like to refocus our thinking about speed and modernism to another kind of speed: the actual speed of production, for though modernism was enthralled with or informed by speed, it certainly was not a speedy craft in and of itself. Consider the years Joyce spent on Finnegans Wake, a book that destroys temporal and spatial borders just as it does lingual, but which was neither speedily written or a “speedy” read. I’d argue, in fact, that the production of modernism was really quite unmodern, relying as it did on the dynamics of medieval book production: small handpress, “DIY publishing,” limited distribution, guild-system-like little magazines. Once we get past his verbosity, it is clear that Brown agrees that modernist book production is archaic; this stems, I believe, from the overlooked fact that he started his writing career as a pulp author, writing “100,000 word typewriter busters” for magazines like all All-Story, Cavalier, Argosy, Telling Tales, and Top-Notch. Like the readie, these magazines confirm Brown’s proletarian tendencies, and, more importantly, they were the products of an entirely different production than the usual modernist forms of first editions and little magazines – a production based entirely on speed. Pulps were fiction for the masses, produced quickly and cheaply for fast distribution, consumption, and disposal. The definition of a pulp magazine is an all-fiction magazine, published on cheap pulpwood paper, priced, marketed, and distributed toward a popular audience. Unlike the slick magazines, pulps did not rely upon advertising, but upon newsstand sales. The idea was to keep the production cost as low as possible so that if only a fraction of the run sold, there was still a profit to be made. It was a product of technological advances in paper manufacturing and the mass printing process, of lowered second class mailing rates, of modern systems of fast distribution. All this resulted in almost instantaneous market reaction to sales and letters to the editors; pulp editors conformed their magazines accordingly, slanting their titles and subjects to whatever caught the public’s fancy, a kaleidoscopic reflection of social tensions, publishing at a speed akin to an impressionist painting. 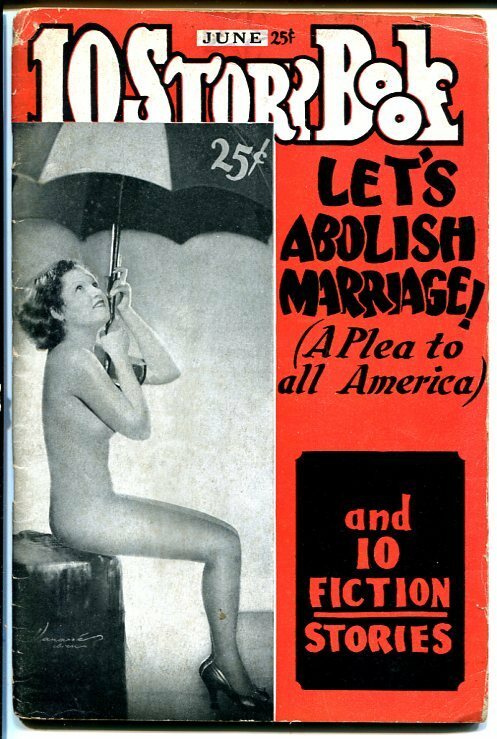 This hyper-capitalism created a public sphere where these magazines and readers defined themselves against both the mainstream slicks and the high-brow little magazines. This was Bob Brown’s training ground. As a “writing machine,” a pulp author is paid by the word; words therefore become objectified, commodified, and lose the aura that modernism imposes upon them. The economics of writing not only gave Brown an appreciation of the physicality of words, but an ability to separate them from their aura and archaic historicity, to see them as type and object. Being a “writing machine” therefore inspired Brown’s idea for a reading machine. Michael North points out that Brown’s own work in the Readies relies upon stereotypical racial identifiers. I would argue that this stems from his experience of quick and reductive characterization peculiar to fast-paced pulp writing. Hence the undeniably modernist “readie” is a direct result of the pulp form acting upon / influencing modernism. And Brown was not the only modernist whose apprenticeship was the pulp genre: the Hemingway collection in the Kennedy holds manuscripts and rejection slips from pulp magazines; Theodore Dreiser and Wallace Thurman were pulp editors; Djuna Barnes’, Tennessee Williams’, and Dawn Powell’s early stories were published in the pulps, and other authors such as William Faulkner and Richard Wright were avid fans. In both pulps and modernism, speed became a point of tension, both a danger and something that, when controlled, deserved respect. Science Fiction pulps were full of stories about temporal instability, time travel, clashes of old and new technology. The pulp subgenre of the Railroad story conflated modern form and subject matter, and approached a self-reflexive synaesthesia since subject, venue, and readership intersected: Railway stations were an important venue for the pulp magazine; the railroad pulps pandered to the commuting readership by taking as its subject the trains themselves and those who rode them. 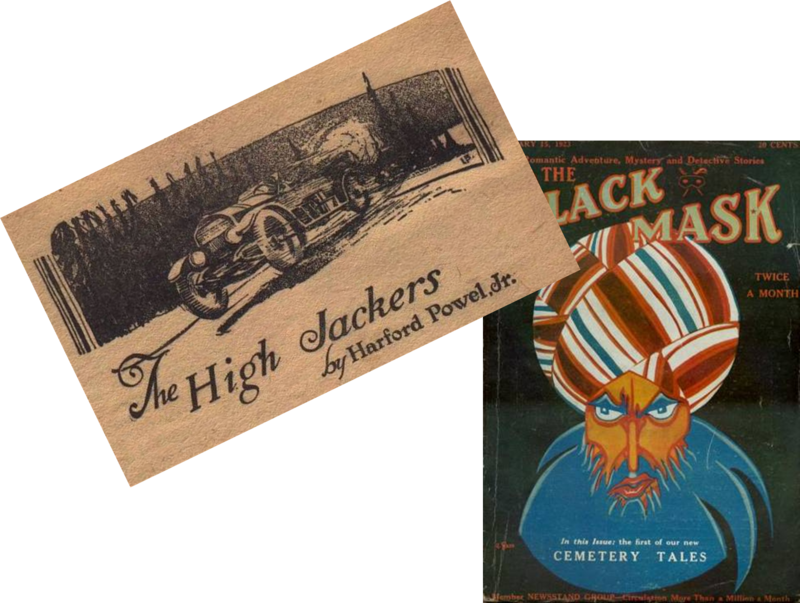 Other stories, like “The High Jackers” from an early Black Mask, used the idea of speed as social criticism. It features a hero who is a “graduate” of the Indianapolis 500, and now whiskey runner for a local judge; his expertise at high speeds earns him respect while the judge (and his cronies, a bank president and newspaper editor) are harshly criticized for hypocrisy and corruption. 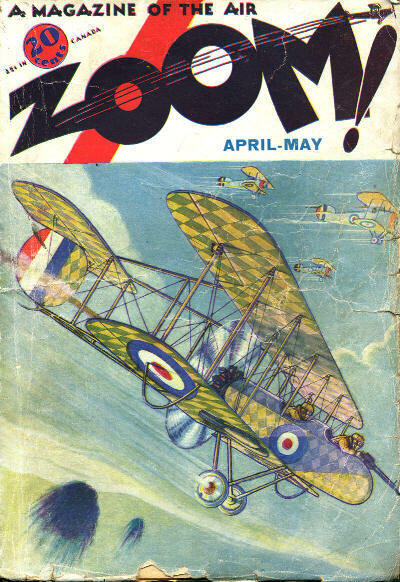 Along the same lines, the milieu of Faulkner’s Pylon – a novel about air shows (and less overtly commercial art) – is the popular aviation pulp genre. That fact that the pulps could be socially critical defies Adorno and Horkheimer’s idea of the culture industry destroying critical thought and individualism. 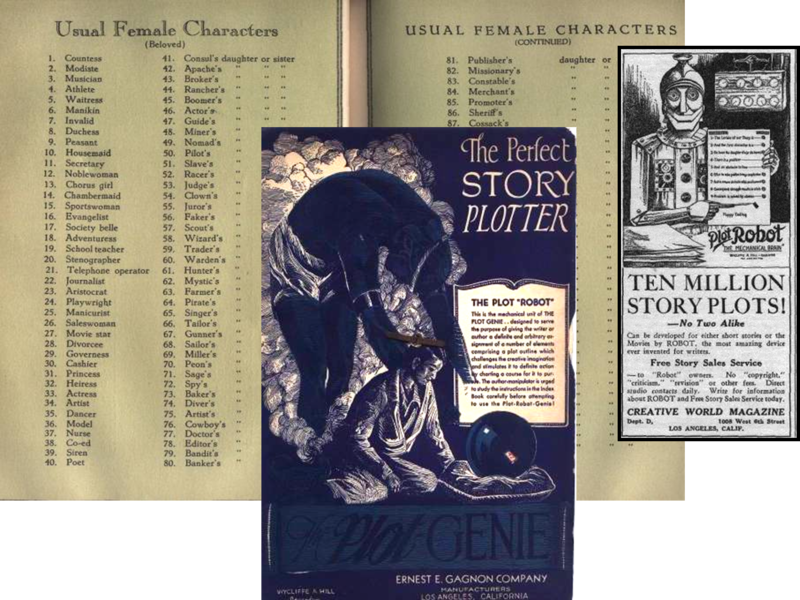 And, granted, pulp writing was formulaic, standardized – so that tools like the Plot Genie were used to expedite composition. These books listed hundreds of numbered possibilities of all the elements of a story, from protagonist to locale to complications and love interest. All the author had to do was to turn the dial of the cardboard “plot robot” which resulted in a random number that appeared in the plot genie’s crystal ball and then find the corresponding element – for example, you need a “predicament or crisis,” dial the number and you get 36, “One is about to be attacked by a maniac.” The author stressed both the importance of style in his method and how the randomness of the plot robot fought cliché. This fordism of writing resulted in the need for fast, instantaneous characterization, which, as I’ve noted resulted in stereotypical, often racists, signifiers, but also metonymic symbolism, as in the “V” motif that describes Sam Spade in the opening paragraph of Maltese Falcon. But, I’d like to give you an example of how this standardization of writing resulted in an instance of purely pulp modernism, an author and form of writing that reflects the modernist sensibilities of Joyce’s Finnegans Wake. 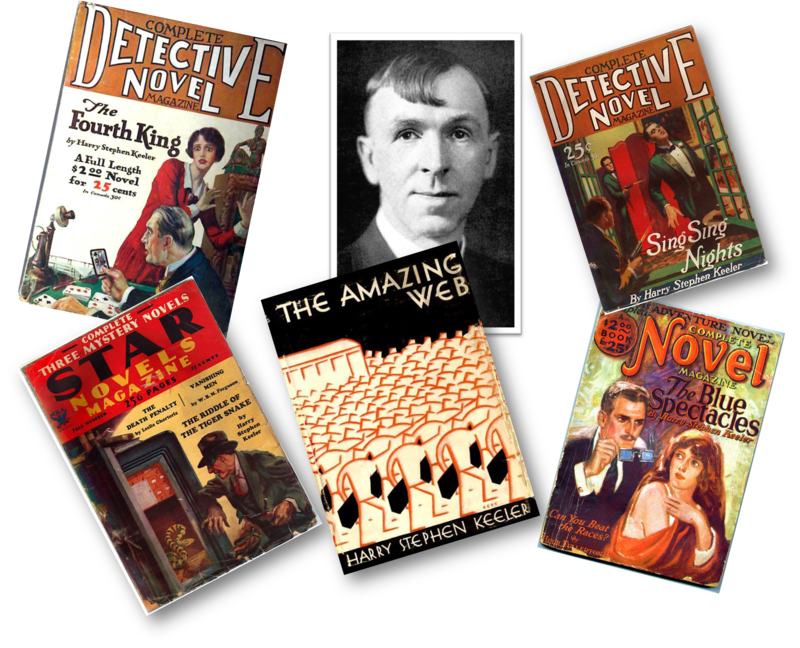 Let me introduce you to Harry Stephen Keeler, author of over 75 mysteries, editor of Ten Story Book. Keeler specialized in pulp magazine serials that he turned into massive books (at one time he had the longest mystery story ever at 350,000 wds, which is also the length ofUlysses) with plot structures so intricate and vast that the overall feeling is of vertigo, of surreal yet seductive disbelief. A reader doesn’t so much read a Keeler book as jumps on for a ride full of impossible coincidences, whimsical names, and such a convoluted plot that there is no possibility for a “whodunit” ending. It would be almost impossible to synopsize the plot of a Keeler book so I’ll give you enough to convey their reliance on random coincidence. 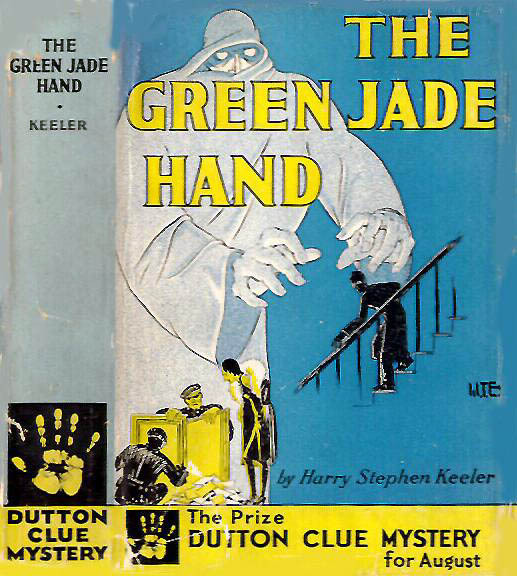 The Green Jade Hand(1930), for example, involves the murder of an antique dealer whose safe contains both a priceless book and a jade hand which holds the clue to where thousands of embezzled dollars are hidden. The jade hand was bought off a hobo who found it in a bowl of chop-suey where it was dropped by a Chinese cook who stole it from the now deceased embezzler. The hand is being sought after by the thief’s Cleveland boarding house owner, who is by coincidence the ex-wife of an ex-convict safe cracker who was coincidently childhood friends with Dirk Mattox, who happens to be engaged to a girl whose father is an avid book collector and is the only one who knows the priceless book is in the safe. It soon turns out the hobo who coincidently gets a job with Mattox, is actually the long, lost son of the book collector. All the mysteries are wrapped up on the last page. While this in no way does justice to the book, it conveys the complexity and absurdity of a Keeler “Webwork” novel, which is what he called books constructed through his formula of “Web Work Plot Design” – a system Keeler invented to create mystery with such interwoven character and plotlines that they resemble electrical system schematics rather than Freytag’s pyramid. Keeler outlined his methodology in a series of articles, “The Mechanics (and Kinematics) of Webwork Plot Construction” inAuthor and Journalist, first in 1917 and expanded in 1928. (I should point out here that Keeler was initially trained as an engineer.) 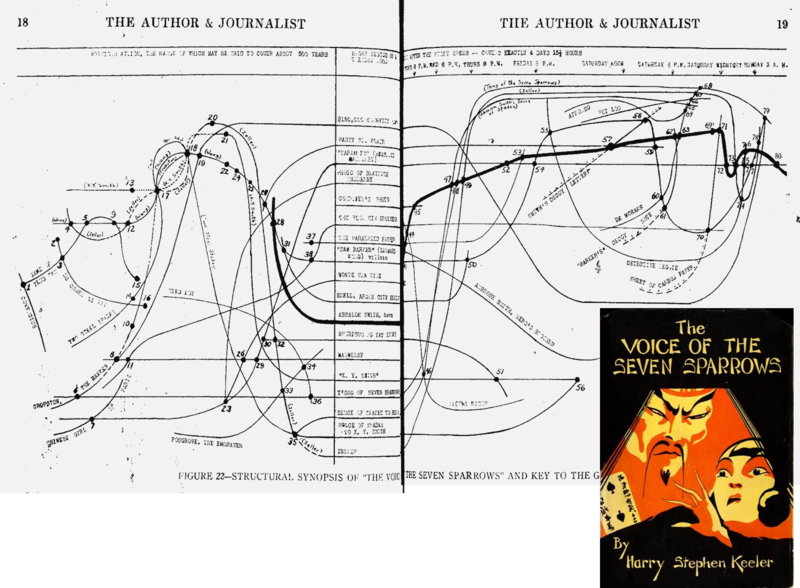 As a way of illustrating his technique, he published the schematics for his Voice of the Seven Sparrows, which, if nothing else, illustrates the complexity of his system, which he also presented in algebraic, mathematical formula. Next to this, the Plot Genie was a child’s game. Keeler takes formulaic pulp conventions and compounds them to such an extent that they become absurd. Coincidences don’t offer deus ex machina closure, but are so ubiquitous that they are the engine that moves his books forward, involving not one mystery but dozens. Many of his books use Russian-box narratives which often blur together with supposedly fictional characters suddenly appearing in the framing narrative. My earlier comparison between Keeler and the Wake wasn’t spurious. The Wake is a web of allusions culled almost randomly from Joyce’s wide-ranging reading, from newspapers to philosophy, which he linked via word play and themes of anti-structuralism. 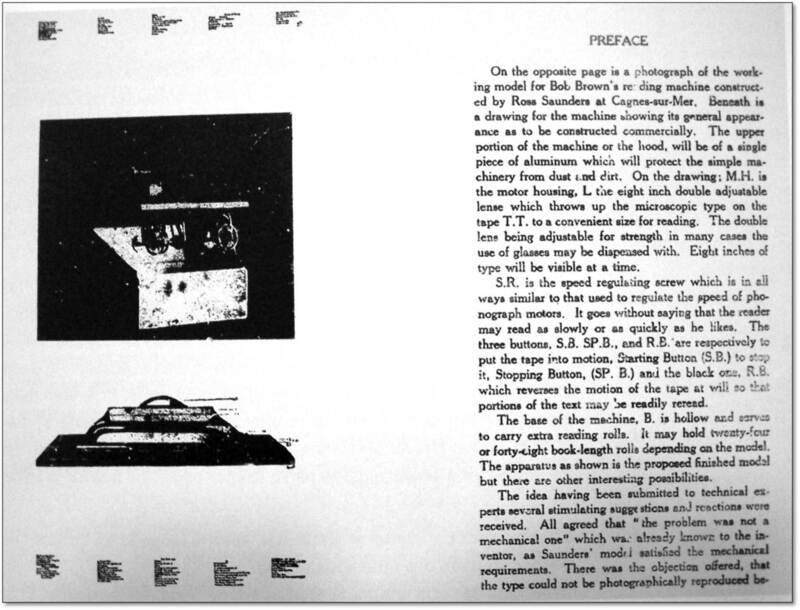 Likewise, Keeler kept files of random newspaper clippings that he then wrote into his stories, linking them together via his intricate webwork of plot and coincidence, but rather than a form based upon anti-structuralism, Keeler’s is formula and structure consciously taken to the point of absurdity. Indeed, reviews of Keeler often made parallels between him and modernism: one critic stated that Keeler should write his “stories once in English, instead of three or four times in a strange jargon which eschews distinction between the parts of speech, and employs such a system of punctuation as no other writer, save, perhaps, Gertrude Stein ever dared.” Another reviewer contended that Keeler’s books were written in Choctaw, others that they needed to be translated into English. This was similar to the popular reaction that Finnegans Wake received: i.e. that Anna Livia Plurabelle be published with a “Joyce Dictionary,” or that The Wake was an onslaught on the English language. But Keeler’s plot construction is more than just an exercise in form, for it offers a portrait of the world where randomness and structure merge and consciously force existential issues of free-will, of entropy and the instability of time. Works such as The Chameleon and The Mysterious Mr. I, (actually a single novel split due to length) question the stability of identity through an unreliable narrator who changes personas more than fifty times. The book is arguably Keeler’s masterpiece and, like Ulysses, follows the narrator for twenty consecutive hours through Chicago rather than Dublin. Like Ford’s The Good Soldier, the plot is layered, with the narrator constantly playing with the reader’s expectations. More importantly, in it Keeler rationalizes his writing method as linked to his existential philosophy. At one point, when the narrator impersonates the professor Scopester Glendenning, he proves that “effect” actually produces “cause,” that what is deduced as randomness can in actuality be a pattern but one that man doesn’t have the critical distance (or scope of time) to recognize, hence the pattern of cause and effect, x then y, is just one current pattern of results in a multitude of possibilities. The description, which is ipso facto a description of chaos theory, not only parallels Bergsonian ideas of the instability of the present, past, and future, but also the concepts of (non) temporality that structure Finnegans Wake, as numerous critics have pointed out – or as Joyce himself put it: “At no spatial time processly which regards to concrude chronology” (358.5-6). Glendinning ends with a discussion about how the passage of time is just the third dimension trying to impose structure on the fourth; “And so,” he says, “Time is, in essence, only Space! And were the fact of the 4-dimensionality of the Universe fully understood … by magazine and mystery novel readers, fiction writers could no longer write mystery stories known as ‘locked-room murders[. ]’” He then goes on to cite one of Keeler’s own books as an example. Remember that this is in the midst of a narrative where the reader has no idea who the narrator is. Unquestionably, Keeler is explaining his destruction of the formulaic and traditional mystery while reflexively adhering to the form. In a Keeler webwork plot, randomness – or chaos – becomes the form or structure itself, form in chaos. 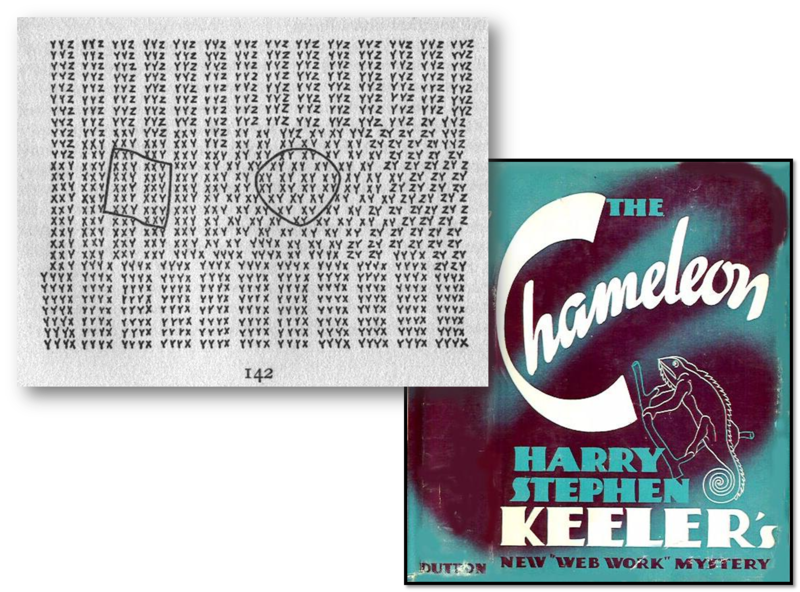 But more than this, Keeler’s Webwork design allowed him to expound upon this in not one novel, but dozens of speedily written mystery novels, many of which have reoccurring patterns of situations, objects, and characters, creating both a Faulknerian world and a Yeatsian symbology. I could go on, pointing out how Joyce and Keeler meet in a melding of extremes, how both mystery novels and the Wake challenge and involve the reader, an integral aspect of modernist stylistics, hence the Wake is itself innately a mystery. Furthermore, like Pound’s perhaps quixotic hope for the Cantos to appeal across the spectrum of audiences through high and low allusions, the Wake leveled the playing field for all readers, destroying hierarchies — though the elite and material production doesn’t substantiate this. Keeler on the other hand used the speed and modernity of production – pulp conventions, a popular form, and the most populist publishing houses that specialized selling to lending libraries. We could say that Pound and Joyce’s traditional modernist agendas failed where Keeler succeeded. But perhaps that is too contentious. I think that it is enough to show that the pulp form, by its very extremity, offered a populist version of modernism. This entry was posted in Commentary and tagged bob brown, finnegans wake, harry stephen keeler, Modernism, MSA, pulp magazines, pulp magazines project, transition. Bookmark the permalink. Nice one. Check out Enda Duffy’s The Speed Handbook if you haven’t already.